Until May 2nd you can visit the exhibition “Jewellery, Wedding & Valentine Show” at Kath Libbert Jewellery Gallery. 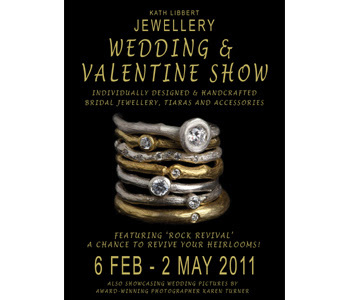 Fins el 2 de maig es pot visitar l’exposició “Jewellery, Wedding & Valentine Show” a la Kath Libbert Jewellery Gallery. Kath Libbert: We bring together the skills and design talent of a select group of very prestigious jewellers who are happy to breathe new life into pieces that have perhaps been languishing just waiting to be transformed into something fabulous. We offer an opportunity to work with these designers to create beautiful, one off bespoke pieces of jewellery. This entry was posted by Montserrat Lacomba at 9:43 am. | This post has no responses. This post is filed under Blog, UK and tagged with Alexis Dove, Anthony Blakeney, Bex Bardon, contemporary jewelry, David McCaul, Diana Porter, Graeme McColm, Iain Henderson, Jacks Design, James Newman, Jo Hayes Ward, Josef Koppmann, Kate Smith, Kath Libbert Jewellery Gallery, Lucy Martin, Malcolm Morris, Michael Carberry, Mikala Djorup, Mirri Damer, Natalie Jane Harris, Nicola Perkins, Poppy Dandiya, Sarah Lawrence, Shona Carnegie, Tanja Ufer.